This jewelry set displays one pair of tiny CZ studs, one pair of polished studs and one pair of small hoops. The CZ stud earrings feature 3mm round cubic zirconia stones, the polished studs feature 3mm tiny ball beads and the hoop earrings feature 12mm mini thin hoops. The studs secure with post and friction backs and the hoop secure with click-top clasps. They have a comfortable fit and are the perfect size. Wear them as single or multiple pairs. They can be used for cartilage, ears, lips, eyebrows and body piercings for numerous holes. Purchase these as regular earrings or body jewelry. 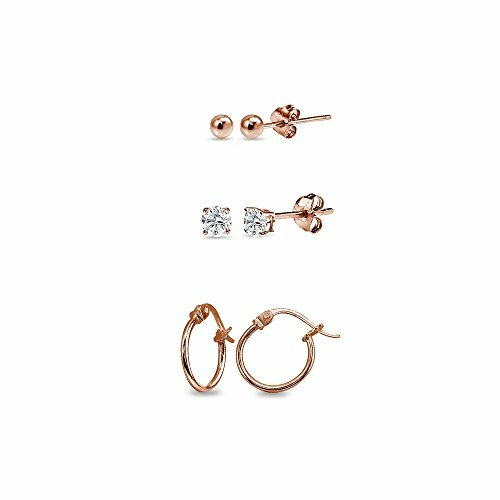 FEATURE - Jewelry set displays one pair of 3mm mini ball bead studs, one pair of 3mm CZ studs and one pair of 12mm tiny thin hoops. They have a comfortable fit and are the perfect size. Wear them as single or multiple pairs. They can be used for cartilage, ears, nose, lips, eyebrows, belly button and body piercings for numerous holes. Purchase them as unisex earrings, earrings for men, earrings for women, earrings for adults, earrings for teen girls or earrings for children.